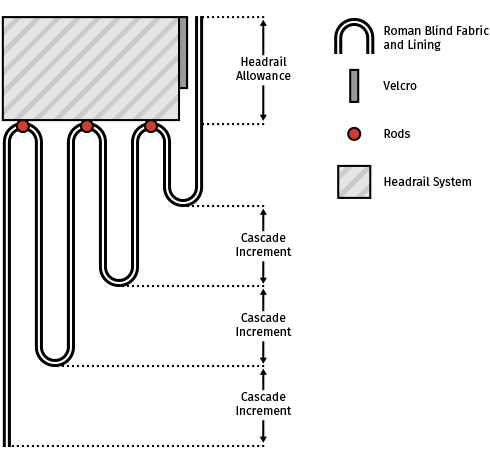 This page will walk you through the preparation and assembly of a Roman blind. A Roman blind is a rectangular panel of fabric supported on a headrail above the window. When fully closed (or lowered), the blind appears as a flat, rectangular piece of fabric covering the window. 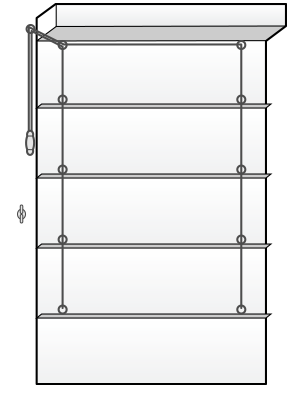 It is opened (raised) by lifting the lower edge towards the top, resulting in a series of horizontal folds across the blind. To prevent the folds from sagging, horizontal rods are fitted to the back of the blind at appropriate intervals. These intervals determine the fold depth and the number of folds in a blind. 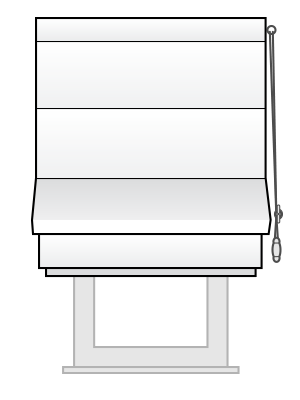 The blind is closed (lowered) and opened (raised) by cords which run vertically down the back of the blind, threaded through cord rings which are attached to the horizontal rods. The cords are guided through a headrail system and can be locked in any position between fully open and fully closed. The headrail system also supports the top of the blind, usually on Velcro. A counterweight at the bottom of the blind ensures that it drops evenly when lowered. In a standard Roman blind, all the folds are equally sized. In a cascading blind, each fold is a little smaller than the one below giving a cascading or waterfall effect. When you first register with Roman Blind Wizard, you will be allocated a set of default Parameters which define the cutting and making allowances for your blinds. You can change these parameters to suit your own preferred method of working. Accurate measurement of window is essential, especially if the blind is to be fitted inside the window recess. 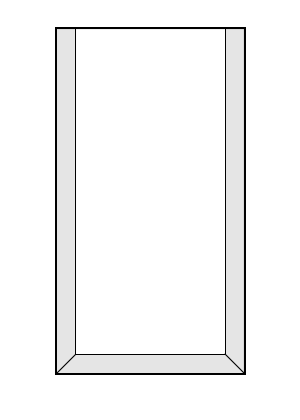 Note that windows are rarely true squares, so take measurements at several positions and use the smallest measurement if the blind is to go inside the recess. For blinds inside the recess: Take several measurements within the window recess. Make the length of the blind equal to the smallest length measurement inside the recess, minus 1cm. This will allow the blind to fully close without actually touching the window sill. Make the width of the blind equal to the smallest width measurement inside the recess, minus 1cm. This will allow the blind to be raised and lowered without snagging the window recess. 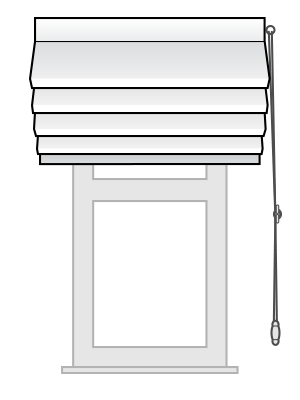 For blinds outside the recess: Allow for the blind width to overlap the window recess by approximately 5 – 10cm each side, and about 5 – 20 cm above the window. If there is a window sill which protrudes very far, this will set the bottom position of the blind, otherwise you may allow the blind to extend below the sill. Enter the information into the Roman Blind Wizard Calculator screen, using the help text to guide you. The Wizard will guide you, as far as possible, to enter logical data at every field, and will calculate and suggest ideal values where appropriate. You can change your entries until you are happy with the specification, but make sure you tab through all the fields to the final “calculate” button when you have finished entering data. Only click “calculate” when you are sure that you have entered all the data accurately. Window reference: Enter a description which will identify this window - for example Mrs Smith Master Bedroom bay window left side. Your workroom instruction document will be emailed to you with this reference. Fabric: Enter a description of the fabric – for example Prestigious Polo Oyster. This will help to identify the job in the workroom. Lining: Enter the lining to be used – for example ivory cotton sateen. This will enable the workroom to select the correct lining for the job. Interlining: Enter a description of the interlining to be used – for example bonded blackout. If the blind will not be interlined, enter “None”. Imperial - Enter the exact required width of the finished blind, in inches and fractions. You can be accurate to one eighth of an inch, for example, for 34 and a half inches, enter the number 34 then chose ½ from the drop down list of fractions. Finished Blind Drop: Metric - Enter the exact required drop of the finished blind, in centimetres. You can be accurate to 1 mm, for example ninety nine and a half centimetres is entered as 99.5. You should INCLUDE in this drop measurement the depth of any trim which falls below the finished fabric hem of the blind. Imperial - Enter the exact required drop of the finished blind, in inches and fractions. You can be accurate to one eighth of an inch, for example, for 54 and a half inches, enter the number 54 then chose ½ from the drop down list of fractions. You should INCLUDE in this drop measurement the depth of any trim which falls below the finished fabric hem of the blind. 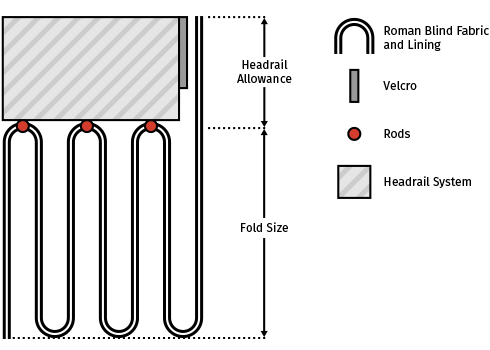 Headrail Allowance: Metric - This is the amount of space occupied by the headrail – the hardware at the top of the blind - and depends upon your chosen headrail system. As a guide, for sidewinder systems allow 5 to 5.5 cms and for wooden battens with screw eyes allow 6 to 7 cms. 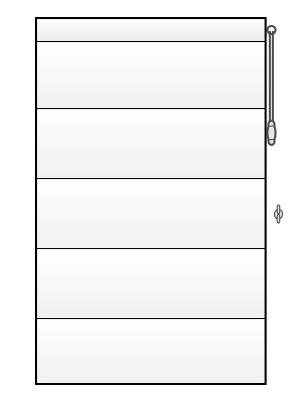 Imperial - This is the amount of space occupied by the headrail – the hardware at the top of the blind - and depends upon your chosen headrail system. As a guide, for sidewinder systems allow 2 to 2 ¼ inches and for wooden battens with screw eyes allow 2 ½ to 3 inches. Additional depth on bottom fold (if any): You may wish the final fold of the blind to extend a little further than all the other folds, perhaps to fully display a decorative border or shaped edge at the bottom of the blind, or to prevent sun damage to the other folds. You may also wish to apply a trim (beads, tassels etc) to the bottom of the blind. In this case the bottom edge of the trim will be treated as the bottom of the blind. 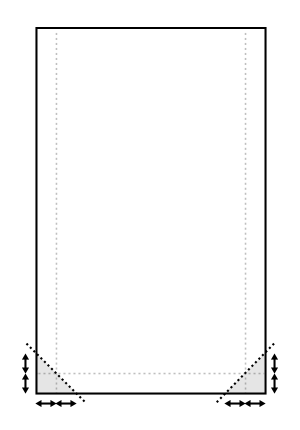 Enter this additional value (in centimetres or inches), or set to 0 if you do not wish to extend the lower edge. You can re-enter different values here to view the effect on the stacked-up depth, before hitting “calculate”. Required number of fold sections (odd number): The Wizard has calculated the ideal number of fold sections for your blind, based on the minimum / maximum fold size specified in your parameters. You must now decide how many fold sections you ACTUALLY want, and this must be and odd number which should be fairly close to the calculated ideal. You might want fewer fold sections (and therefore bigger folds) on a large blind with a large fabric design. You could decide on more fold sections (and therefore smaller folds) on a narrow blind with a delicate fabric design. Remember that a FOLD SECTION is HALF of the distance between the rods. You can re-enter different values here to see the effect on the stacked-up depth before hitting “calculate”. 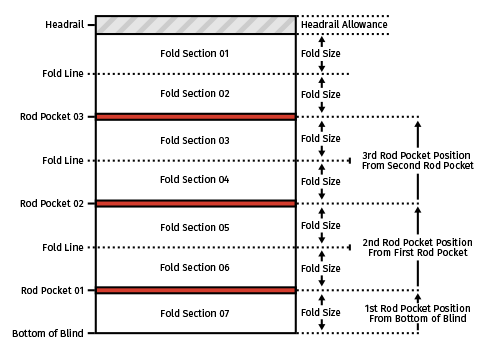 Cascade Increment (Enter zero for standard folds): A cascading blind is arranged so that when the blind is fully folded up, each fold finishes a little lower than the one in front, giving a cascading or waterfall effect. Standard folds all finish at the same level when the blind is fully folded. Cascading blinds look attractive but take up more space even when fully folded up. If you want your blind folds to cascade then you can enter the cascade increment (the difference between each fold) here. This will normally be between 1 and 5 centimetres (¼ to 2 ½ inches), depending on your design preference and the proportions of the blind. If you want standard (self-stacked) folds then enter zero in this field. You can re-enter different values here to view the effect on the folded depth, before hitting “calculate”. The total depth of this blind when fully stacked up: The Wizard will calculate how much space this blind will take up when it is fully folded up (stacked up). This may be important if you need to know how much of the window will be obscured by the fully raised blind, or if you have to make your blind fit into a certain space. You can re-enter the required number of fold sections, cascade increment, headrail allowance and additional depth on bottom fold to view the effect on the folded depth, before hitting “calculate”. Number of cord drops required: The Wizard has calculated the exact number of cord drops for this blind width based on normal spacing criteria. You must enter a whole number which is close to this. You can specify more cords if this is a particularly long or heavy blind. You should only use fewer cords if this is a fairly small, lightweight blind. Headrail Instructions: Enter any details about the required headrail system, for example left or right hand operation, batten, cord lock or sidewinder, safety devices, chain colour etc. You can leave this field blank. Special Instructions: Enter any other instructions, such as borders, trims, fabric orientation and pattern placement which will be required by the workroom to complete the blind. You can leave this field blank. Calculate: Only click here if you are sure all the information you have entered is correct for the blind you wish to make. One credit will be deducted from your account, and the workroom instruction sheet will be displayed (for you to print and/or save on your pc). A copy will also be emailed to you. The following instructions are based on the default parameters, and you should note that the hem allowances, rod pocket sizes etc quoted in the following text may not be the same as your own preferred parameters. To check or amend your Parameters, go to Your Account. Default Parameters used in these instructions. Check the fabric for flaws before cutting, and consider how the fabric pattern will be distorted by the folds of the blind. Think also about the pattern placement, centralisation and fabric orientation. Following the measurements on the Roman Blind Wizard Workroom Instructions, cut out the face fabric, lining and interlining (if using). If the finished width of the blind is wider than the fabric, you must join the widths first. (Full width(s) in the middle and half-widths either side.) Consider railroading the fabric, (Turning it sideways) or adding contrast borders to achieve the desired width, as joins can be unsightly. Lay the lining wrong side up and fold in 2 cm along each side edge of the lining. Lay the lining right side up, with the lower edge closest to you. Using a large set-square, place one side against the folded side edge of the lining, and draw a pencil line at a right angle, about one centimetre up from the bottom edge of the lining, across the entire width of the lining. 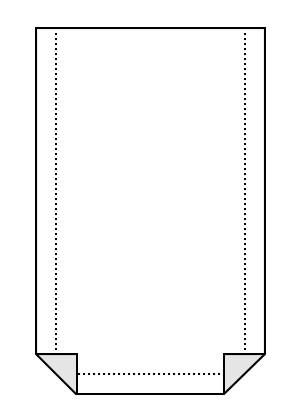 Use the set square to check that this line is also at right angles to the opposite side of the lining. In this way, your pencil line should be a true right angle to the two sides of the blind. This is the line from which your rod pockets will be measured, so it’s important that it is completely square. Fold the lining along the top line, wrong sides together, and pin in place, making sure that the folded side hems are maintained. Check again for exact right angles. Machine stitch along the first measured line (bottom line). Mark the position of the second rod pocket by measuring up from the stitching line of the first pocket. Make this pocket as before. Then measure from the stitching line of the second pocket to mark the position of the third. Repeat until all pockets are complete. In this way, (measuring from stitch line to stitch line) the measurements calculated by the Wizard will be correct, whatever size rod pocket you make, and even if you use rod pocket tape. Measure the side and bottom hemlines at the corner and mark the exact intersection with a pin. Measure the hem allowance from the bottom hem line up the side raw edge and mark. Measure the hem allowance along the bottom raw edge from the side hemline and mark. Join the three marks to form the 45° line of the mitre (in red). Fold and gently press along this line. Turn the side and bottom hems in and pin in place. Position the pins so that they can be accessed after the lining is laid on top. Pin the mitred corners in place. If using interlining, herringbone the side and bottom hems in position, but do not catch the face fabric with these stitches. For fabric and lining hem and making allowances, look at your Parameters on your Account. With the face fabric wrong side up and clamped in place, use the cumulative measurements on the Roman Blind Wizard Workroom Instructions to mark the positions of all the rod pockets along each side of the blind. You are measuring from the FINISHED BOTTOM EDGE of the blind (which may be the bottom of a trim). Place the lining on top with the rod pockets uppermost. Make sure you have the lining with the first rod pocket towards the bottom of the blind. Your original pencil line should be at the bottom of the lining. Position the lining so that the rod pockets are aligned with their markers on the blind, and the side edges of the lining are equidistant (about 1.5 cm) from the side edges of the blind. Pin the first rod pocket in place at both sides, and in the centre of the blind, measuring the correct distance up from the hem of the blind. Check the position of the other rod pockets and pin in place. For wider blinds, check the rod pocket positions at several points across the width of the blind. Pin through all thicknesses along each side. Fold under the hem of the lining and pin in place, leaving a margin of about 1.5 cms. Slip stitch down each side of the lining and along the hem, but do not take the stitches through to the front of the blind. Leave the corner mitres open. Spot tack through all thicknesses along the rod pocket machine lines, under the pockets at the cord guide positions detailed on the Roman Blind Wizard Workroom Instruction sheet. Measure and trim the lining and any interlining at the top of the blind to the EXACT finished drop of the blind. Cut a 5 cm wide strip of single sided fusible buckram, half a centimetre smaller than the finished width of the blind. Place the buckram with fusible side facing the wrong side of the excess face fabric at the top of the blind. Trim the excess face fabric to 4 cms, fold the raw edge over the buckram and press. Machine stitch loop Velcro so that its top edge is exactly on this measured line. You are sewing through the Velcro, face fabric top flap and buckram here, not the face of the blind itself. Then machine along the bottom edge of the Velcro. This row of stitching should catch the free edge of the face fabric which was folded under the buckram. With the wrong side facing you, starting at one side of the blind with a strong thread, make large stitches catching the top raw edges of the lining (and interlining) to the top row of machine stitching that you used for the Velcro. This prevents the top edge of the lining and interlining from sagging inside the blind. Use one continuous thread for this, so that you can gently pull on it when you get to the other side, thereby helping the facing to lie flat. Fold the facing over to the wrong side and secure with pins. Slip stitch the side and bottom edges of the facing to the blind. Do not catch the face fabric in these stitches. Following the measurements on the Roman Blind Wizard Workroom Instructions, cut the required number of fibreglass rods and the aluminium weight bar to the required size. The hardware cutting allowances, are defined in your Parameters. Beware of fibreglass splinters when cutting the rods. Fit end caps, insert into the rod pockets and close the rod pockets with a few hand over-stitches. Fit end caps to the aluminium weight bar, insert into the hem and close both mitred corners with ladder stitch. Slip-stitch the lining in place around the corners. Following the measurements on the Roman Blind Wizard Workroom Instructions, sew the required number of cord rings to each rod pocket. Cut your chosen headrail system to the width specified on the Roman Blind Wizard Workroom Instructions. Decide left or right hand operation and assemble the headrail system accordingly. Attach your blind to the chosen headrail system and thread the cords through the cord rings, securing with a compliant breakaway device at the bottom ring. Most headrail systems are supplied with brackets which can be fitted either to the wall or the ceiling, depending on the position of your blind. Wooden battens can be drilled with holes at the required position for fixing. When fitting, make sure that the headrail is horizontal so that the blind will hang square. Any blind you make MUST conform to British Standard EN13120. Choose headrails and components which are compliant, and make sure you follow the manufacturer’s instructions for assembly and installation. Young children can become entangled in cord and bead chain loops, resulting in injury and death. It is YOUR responsibility to ensure that your blinds have been made and installed to be Child Safe.